Two EMTs, a surgeon, a cop and a firefighter walk into a bar... after pretty much every shift. These guys aren't just the best first responders in the city, they're also best friends. Which makes it really awkward when four of them—yes four–break the don’t-mess-with-your-friends’-sister rule. And just like they do everything…when they break that rule, they go *all in*. 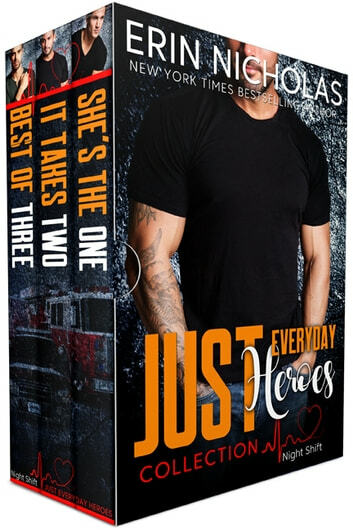 If you love brother’s-best-friend romances (or hey, if you love friends-to-lovers, reunion, enemies-to-lovers romances or just big, dirty-talking heroes!) this is the set for you! Check out the first three books in the Just Everyday Heroes: Night Shift series!